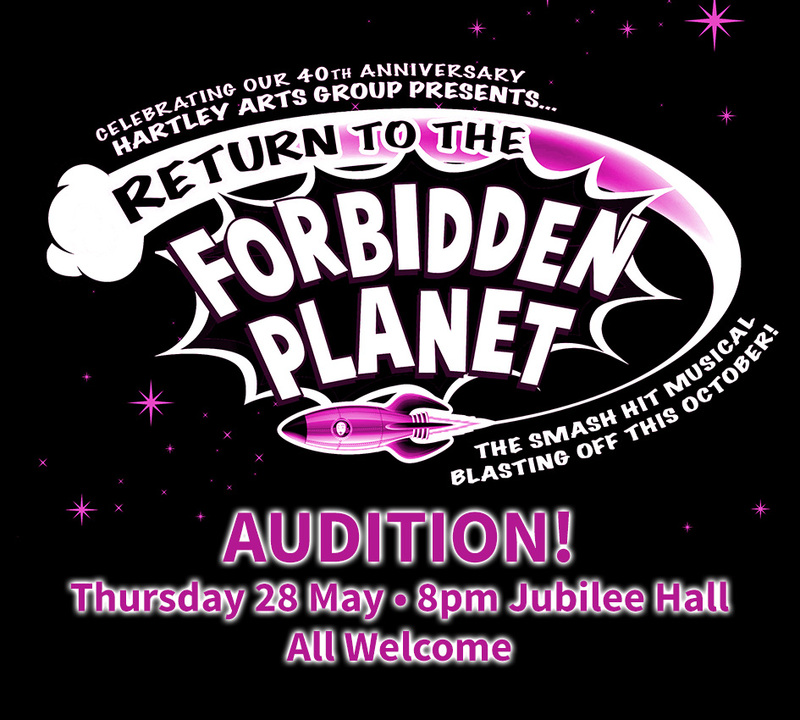 Wed 19th April 8-10pm, Edward Hall, Hartley Wintney Don’t forget to put this date in your calendar now. We would like to see as many of you as possible. Old friends and new ones too – all welcome. Outside Edge and Northanger Abbey are the 2 plays shortlisted for our October production. Which one will it be?? Come along to help us decide! Thank you to everyone who voted. It was a very close finish and so we will be reading excerpts from the 2 most popular plays as voted for by you. OUTSIDE EDGE by Richard Harris and NORTHANGER ABBEY by Jane Austen, adapted by Matthew Francis. Put the date in your diary now – Wed 19th April 8pm. Edward Hall, Hartley Wintney. Please come along and help us to decide which one will be our October production. 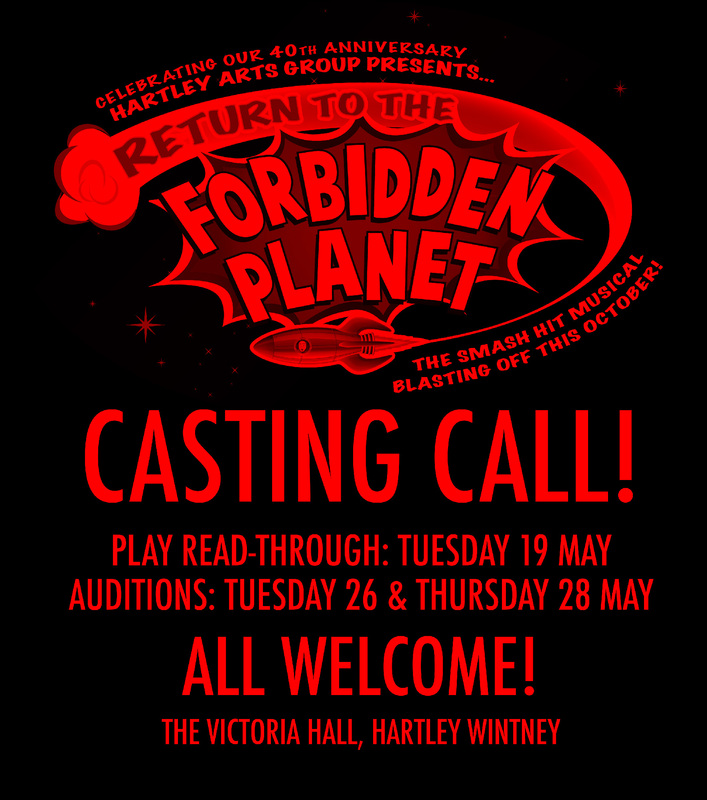 Whether you want to act, direct, design set, paint set, operate sound or lighting, make costumes, collect props, help front of house or stage manage – WE NEED ALL OF YOU. EVERYONE WELCOME – members and non members alike. Committee members will be there to answer any questions you have about your membership/ how to join/ how to renew or indeed anything else you can think of! So let’s get together and have some fun! Your opinion matters to us, so please find below a link to a very short survey (2 questions), asking for your rating of the committee’s proposals for our October production. Please click on the link to complete the survey before Friday 10th March. Thank you for your time and your opinions. 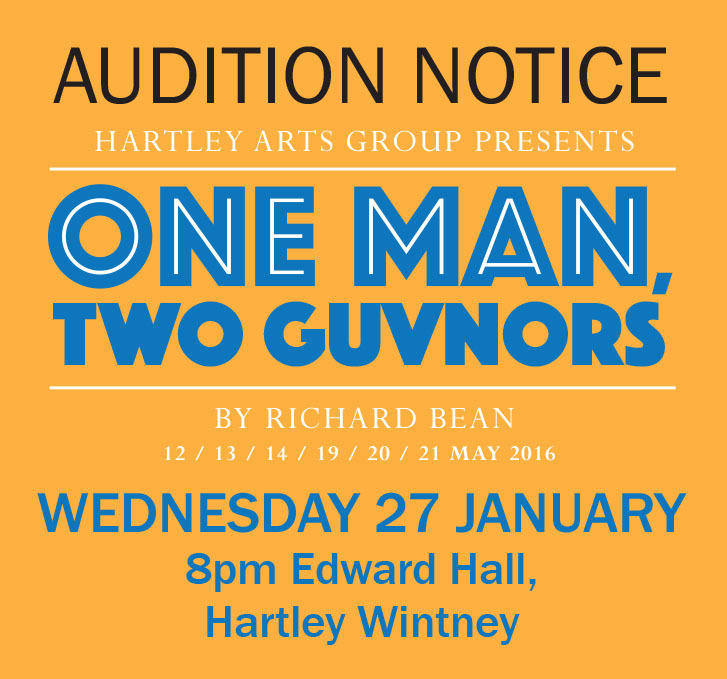 The audition for ONE MAN, TWO GUVNORS is being held on Wednesday 27 January at 8pm, Edward Hall, Hartley Wintney. 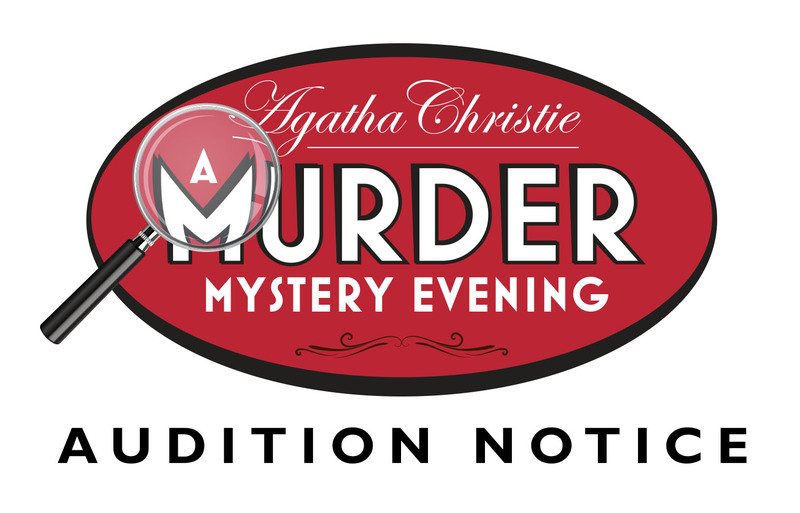 3rd and 5th November, 8pm Jubilee Hall for our popular Dinner Theatre Murder Mystery production(4, 5, 6, 11, 12, 13 Feb 2016). Agatha Christie’s ‘Cards on the Table’: Mr. Shaitana is a strange and wealthy collector of snuff boxes and other objets d’art. One evening he invites two specialists, Superintendent Battle of Scotland Yard and crime novelist Ariadne Oliver, to a dinner party to view his special collection: four people who have committed murder and gotten away with it. As they play bridge after dinner, someone is daringly murdered by someone at the party. Battle sets out to solve the crime aided, of course, by the eager Mrs. Oliver who begins with psychological deductions from the bridge score cards. Red herrings, skeletons in the cupboard and more deaths abound! 7m/7f. 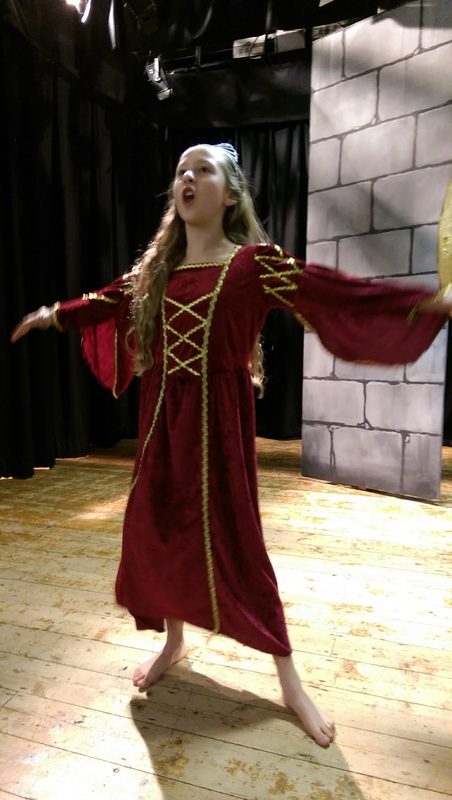 Next play workshop – all invited! Gill Richardson, director and Kelvin Fay, Production Manager will be hosting a workshop for this play NEXT Tuesday 10th February from 8pm at the Jubilee Hall. This is a great and informative evening even if you don’t want to be in the play! Auditions for Abigail’s Party are on Tuesday 24th February – make a note in your diary. Rehearsals begin IMMEDIATELY afterwards on 26th February.